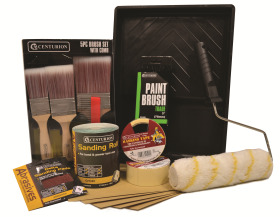 Centurion has everything you need to offer a retail ready decorating range that includes brushes, rollers, trays, fillers, adhesives, wire brushes, scrapers, scissors and more, the company says. The Craftsman Pro range of brushes is extremely high quality and offers you great margins. The Abrasives brand is made up of a complete range of preparation products including sandpaper, steel wool, sanding discs and triangles and much more. Merchandising is available on all Centurion Decorating products, and they are currently offering an additional 5% off Decorating Merchandisers if you show this advert to your Area Sales Manager.